The cabbage white lurches honestly. This particular cabbage white of whom I found a photo seems to be resting on a flower very similar to the one my recent honeybee was drinking from. Just a long-ago Christmasy post for this season! I’ve made these exotic Italian cookies the last two Christmases before this one. Not this year. But they are so pretty, I’m going to post the photos for your enjoyment–and the recipe, too. I got the recipe from a library book ages ago and don’t know where to give credit. I looked at scads of other Neapolitan recipes on the Internet–I forget why–and they were all dreadfully inferior. This one uses two different doughs, each with many tasty ingredients, whereas the others I saw used just one fairly simple dough that just had different food colorings added. 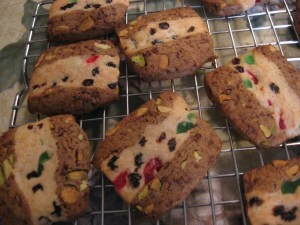 This one also has no food coloring other than what is in the candied fruits. These Italian cookies present an interesting way of making icebox cookies. They are dramatic and unusual. You will make two entirely separate recipes for the dough—and it must chill overnight.